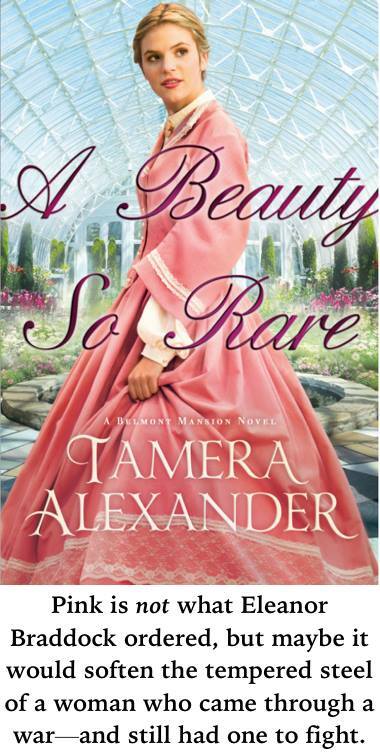 I’m so happy to be sharing my review of Tamera Alexander’s latest novel, A Beauty So Rare¸ today! It is a beautiful novel that shares the hearts of the characters – and the beauty of God’s provision for us. Rich in historical details, it is set at the beautiful Belmont Mansion in Nashville (still standing today). I am privileged to be a part of a special group of reviewers who have access to extras on the novel – you can find a savory custard recipe from the novel here, and a shortbread recipe soon to come! Kind, plain, and practical, Eleanor Braddock has come to Nashville for a new life after the Civil War. Facing her father’s declining health and her family’s dwindling finances, she moves to the prestigious home of her Aunt Adelicia Acklen, the famous Belmont Mansion. Hoping to achieve her independence from the benevolence and good intentions of her feisty aunt, Eleanor plans to open a restaurant to support herself and her father. Aunt Adelicia, however, disapproves of Eleanor’s premature plans to tarnish her social standing by cooking. Adelicia has other plans for Eleanor, including a potential suitor who could secure Eleanor’s future. But at what cost to her happiness? Marcus Geoffrey, the Archduke of Austria and second in line to the throne (complete with good looks and a dreamy accent), has come to Nashville seeking to make a name for himself based on his own merits, not those of his family name. Finding solace in a new country by concealing his true heritage, he dreams of using his architect design and botany skills to achieve a lasting accomplishment of beauty and utilization. While he works at the conservatory at Belmont, he meets Eleanor and begins a friendship. As their paths cross in unexpected ways, God begins to give them a new dream and purpose in helping those less fortunate in the aftermath of war. Both Eleanor and Marcus are enduring new seasons in their lives. Eleanor is unsure of herself, feeling somewhat out of place now as the responsible adult of the family, with her father dependent on Eleanor’s decisions. She has to learn to trust and to have a different relationship with him now. Marcus is also on his own, enjoying a unique sense of freedom – but still sensing a foreboding and pending commitment to his family and the House of Habsburg. As their relationship grows from that of friendship and confidants to something more, both must find the courage and strength to face their futures – futures that likely don’t include each other. I really loved how Tamera showed a different side of the aftermath of the Civil War. She did so through immigrants’ experiences, specifically widows and orphans, as they struggled in that era. I also enjoyed the themes of botany and cooking featured in the novel. At times I could almost smell the fragrant peonies and roses. And the food! Let’s just say my mouth WAS watering sometimes. Doughnuts, strudel, custards, soups, shortbread….are you hungry yet? A Beauty So Rare is a delightful story of love, trials, purpose, family, and history. Both main characters find purpose in helping others. Though neither one’s path is what they first thought it would be, God proved faithful and showed them how He is able to take mere dreams and make them much better, even if it at first seemed hopeless. I would highly recommend this book to anyone who loves history and romance. These characters are so dear and realistic, and the storyline perfectly complex, I feel like a simple review cannot do the story justice. You should just find a copy for yourself today – you won’t be disappointed! 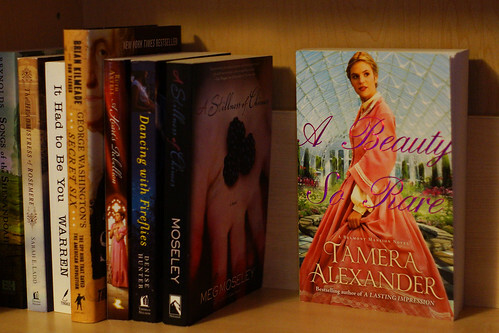 For more fabulous book extras and information about Tamera’s other books, visit her website, her Facebook page, or find her on Twitter. A huge THANK YOU to Tamera Alexander and Bethany House for the opportunity to participate in this group of blogger reviewers. I received a complimentary copy of this book in exchange for my honest review – I was not required to write a positive review. This entry was posted in Book Reviews, Books and tagged A Beauty So Rare, Architecture, Belmont Mansion, Bethany House, Book, book review, Botany, Christian Fiction, Civil War, Empty Shelf, Empty Shelf Challenge, fiction, Historical Fiction, History, literature, Nashville, Reading, Review, Tamera Alexander. Bookmark the permalink. Did you review Stillness of Chimes? It was awesome! Yes, I reviewed A Stillness of Chimes – it was sooo good, too! Always happy to visit! I just don’t get into my WP reader as often as I want… Must remedy that.